The start of the Dark run. 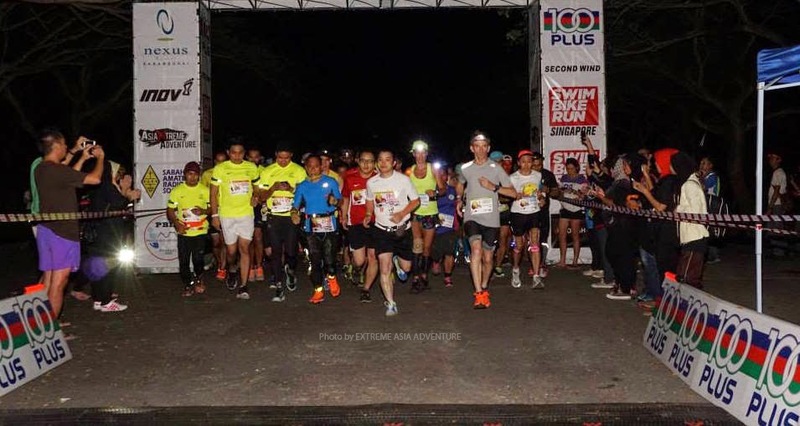 A unique Annual marathon event called X12 Dark Run took place at 12.00 midnight on the of1st of March this month organized by Asia Extreme Adventure (AXA). The event was held at the Nexus resort at Karambunai. For this special event all runners were painted in colourful glow in the dark paints and many of them wore glow sticks that also glow in the dark as necklaces and bracelets. This was the first time that such an event had been organized in Sabah. Even though Midnight run is very common in other parts of the world especially the United States and Canada. 2 of the runners from the United Kingdom. In this inaugural X12 Dark Run, there were 4-race categories- a 5km fun run, 10km, half marathon and the full marathon. The X12 Dark Run is the perfect platform for runners of all levels, giving them the chance to step out of their comfort zone and challenge their limits, whether they are true blue running advocates or casual fans. For this event there were over 1,700 participants from all walks of life. The oldest participant was a 70-year-old man from Brunei while the youngest was a 4-year-old girl from Austria (she took part in the 5KM run). Besides the many local participants, many had come from Sarawak, Peninsular Malaysia, Brunei, the Philippines and even some from Hong Kong. There were many nationalities that took part in this Midnight run, with the greatest number being Malaysian together with a few English and some European expatriates from the Asian region. The different running categories were the Men / Women Open and the Men / Women Veteran for runners who are 50 years and above. The cut-off times for each event were as follows: for the 42 Km (full marathon) it was 7 hours and 4 hours for the (half marathon -21Km). While runners had 2 hours to finish the 10-kilo meters and 1 hour to do the 5 Km run. All Participants of the midnight run were presented with a T-shirt, surprise gift, a running bib and an e- certificate while only finishers of the 42km run received a special T-shirt. Medals were presented only to runners who completed the 10km / 21km / 42km runs .An exciting twist to the AXA events is the 5-series medals. For every AXA event you complete, you get a unique medal. Collecting all 5 medals will unlock the 6th medal that locks all 5 medals into 1 unique big medal. Come challenge yourself and earn this awesome medal series. Other up coming events include an X3 Challenge (5 June), X123 (9 Aug), Xtrail (1 Nov) and XC2 Xtreme Course Challenge (6 Dec).